Boxes surrounded me as I sat in the middle of the office, trying to decide what to keep and what to get rid of. The handmade floor to ceiling bookcases that I once loved now loomed over me, wondering why I did this alone. I had saved this room for last because I knew it would be the hardest and i wasn’t wrong. We had spent countless hours in here together. The deep brown leather chair by the fireplace still smelled like him, cologne and woodsmoke. I had been sleeping in it every night since I’d been back in the house, or as close to sleeping as I could get, just so I could pretend he was still here. Looking around I decided to start with the photographs. Frames were scattered around the shelves, showing us in better times; camping, skiing, riding a tandem bike on Macknac Island. And my favorite picture of the two of us, standing side by side, arms around each others’ waists with Lake Superior shining crystal blue in the background. I lost myself staring at the way the sun glinted off his black curls, finally coming back to reality when I noticed the tears blurring the picture. With a sigh, I wiped the glass off and wrapped it in bubble wrap, packing it up with the rest of the photos. Finally, that left just the books. I wasn’t going to have as much room in my new place, so a lot of them were going to have to go. I was tempted to get rid of most of mine so I could keep his. Anything to keep a piece of him with me. After a few hours of sorting, and a few too many glasses of wine, I was down to his pride a joy. It was a collection of first edition Ernest Hemingway novels, it had taken him forever to find them all and he had been so proud. I pulled down The Sun Also Rises, his favorite, and ran my fingers over the spine. When I opened the front cover, a piece of paper fell out. I recognized it immediately. 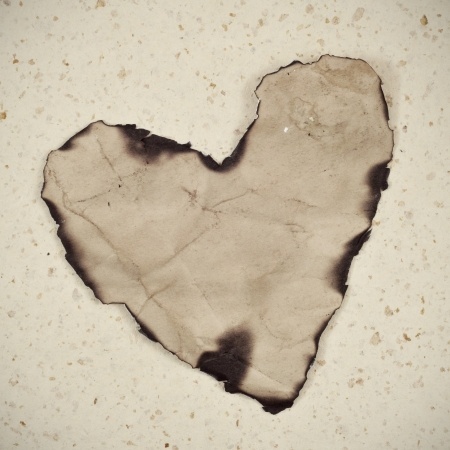 It was a heart shaped, yellowed piece of paper burned around the edges. I had found it in an old diary in an antique shop on a trip out East and it had turned out to be a love letter the diary owner had kept. Now, it looked as though writing had been added to the back side of it that had once been blank. with you and retire by the lake like we always talked about. I want to watch a thousand more sunrises and sunsets with you. end up I will miss you every moment. And know that I want you to be happy in life. that I love you more than anything. And with that the floodgates opened. I sobbed wine fueled, grief induced tears until I finally fell asleep on the floor. Blinking in the bright morning light, I saw two men standing over me. “Who are you?” I wasn’t as alarmed as I probably should have been. The movers left to go start on another part of the house. I looked around the room one more time, making sure all the windows were closed. Standing up, I put the heart shaped note back in the front cover of the book and clutched it to my chest, standing still in the middle of the room. “I love you, too,” I whispered. “Always.” Just as I started to walk away, a small breeze ruffled the hair on the back of my neck, just where he used to kiss me. Aaaaaaaaaaand crying. Damnit, Kayleigh. I’m freaking crying. And I’m not even PMSy – this is all you. You did an awesome job on this. What Bron said. Why must you make us cry? Great story. You nailed this one. I’m so proud of you. I think this is your best story yet. Honestly, I just love it. omg, between you and Bron, I’m now blotchy and wet-faced. Not fair. Beautiful and heartbreaking.